After the Super Bowl came to a close following the Falcons blowing a 25-point lead to the Patriots, online trolls used memes to poke fun at Atlanta's epic choke. New England astoundingly recovered from a massive deficit to beat Atlanta 34-28 during overtime in what will be remembered as the greatest comeback in Super Bowl history. 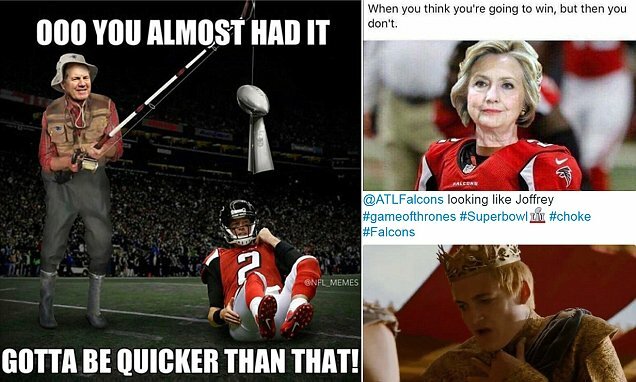 Social media exploded with memes teasing the choke, comparing the team's loss to Game of Throne's character King Joffrey who choked and died during what was supposed to be his shining moment.